One of, if not the primary argument of proponents of home birth is that the process of giving birth is a natural process, one that the female human body was literally designed to do, and therefore barring the occasional special complication, there is no reason to treat it like a medical emergency or disease. And superficially - especially looked at from our current generation's time - that seems to be a pretty reasonable argument. There's just one big glaring hole in that argument: prior to modern medical interventions, giving bilth was the single most likely thing to kill a woman of child bearing age. In the 1850s, those with no access to even the rudimentary level of medical care (i.e. slaves) had a 20% chance of neonatal mortality. In other words, the "natural" process of birth killed 1 out of 5 humans who attempted it. "In the 1850s, the infant mortality rate in the United States was estimated at ... 340.0 per 1,000 for African Americans"
In addition, another 1.5% of mothers die from the process with no medical intervention. "Bearing a child is still one of the most dangerous things a woman can do. It’s the sixth most common cause of death among women age 20 to 34 in the United States. 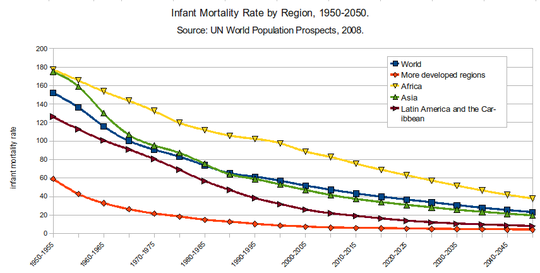 ""In the United States today, about 15 women die in pregnancy or childbirth per 100,000 live births. That’s way too many, but a century ago it was more than 600 women per 100,000 births. In the 1600s and 1700s, the death rate was twice that: By some estimates, between 1 and 1.5 percent of women giving birth died." That makes it a medical emergency. With modern medical intervention, some first world nations have managed to get that natural 20% rate down all the way to 0.1%, 160 times lower. This seems to be a (slightly) less fringe version of anti-vaxxers: precisely because modern medicine has successfully eliminated the threat of so much ("natural"ly occurring) disease, and the generation alive today has never lived in a world with actual plagues, people - especially middle-class white people - have the luxury of ignorance. Since neither they, nor anyone they know, has ever lived in a time or place where infectious disease killed one out of every 3 people they knew, because vaccines have successfully eliminated that threat from our daily lives, they can safely pretend it was never a problem - that really the solution (the vaccines themselves) are the problem. Perhaps even part of some grand conspiracy! To an extent all "alternative" medicine falls under the same category. But somehow home birth has largely escaped the "alternative" label, and even people who would never consider trying to cure cancer by having someone stick needles into their skin or cure an injury by ingesting water that used to have a tiny amount of poison in it but is now just plain water, will non-the-less be persuaded by arguments for home birth. Yes, obviously you will be more comfortable at home. No one likes being in a hospital. No one likes the sterile environment, the harsh lights, the beeps of machines and screams down the hallway, the hurried doctors and nurses. The question is, is that worth the 2-3 times higher risk that your baby will die? "Conclusion: Less medical intervention during planned home birth is associated with a tripling of the neonatal mortality rate." "although the absolute risk may be low, planned home birth is associated with a twofold to threefold increased risk of neonatal death when compared with planned hospital birth." Beside for that (since 2-3 times a very low risk may still be very low, and some may feel its worth it) - somewhere between 25% and 40% of planned home births end up having to transfer to a hospital anyway. Except, then, since that's considered a last resort and was put off as long as possible, instead of transferring with her partner in the family car, it takes place in an ambulance. If the medical emergency occurs just after delivery, mother and baby get transported in separate ambulances. "around 40% of first-time mothers who plan to deliver their child at home end up being transferred to hospital." For some, the motivation is wanting to avoid the more intensive interventions, like C-section or vacuum assisted delivery. The sad irony is that, statistically, planned home births result in being more likely to end up needing such procedures, as a result of not having access to more moderate, intermediate medical options sooner. But, then again - unlike with the anti-vaxxers - at least those who opt for home birth are only endangering themselves and their babies, and not risking any one else in the process. So we can comfortably call each loss Darwinism in action. Assuming, that is, that the person at least had access to the information. Its all there, if you look for it, but now I've consolidated the most important parts for you, so you don't have to.